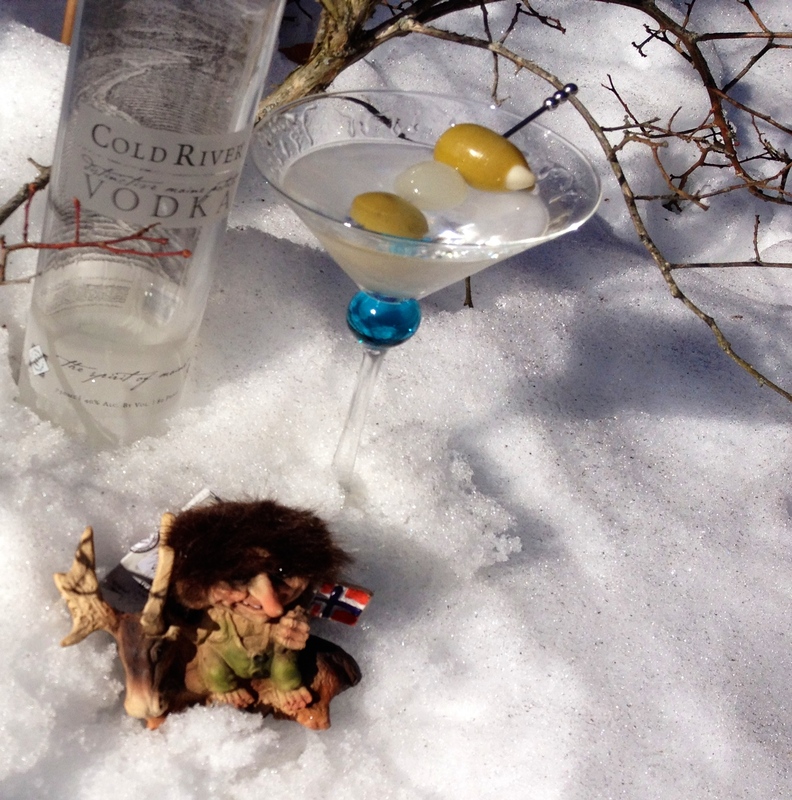 One of the last Martini Fridays of winter. Spring is supposed to arrive in just two weeks but you wouldn’t know it by taking a walk outside. Ice still clings to many of the roads and walkways making travel more difficult especially here at the lake where, for environmental reasons, the city plows do not apply salt or other ice melting chemicals. The same is true on the footpaths in the city forest where we stopped to take our dog for a walk this week. Although we have not had a significant snowfall in two weeks, the temperatures have stubbornly refused to rise above freezing. What melting there is from radiant heat during the day quickly freezes as temperatures drift between single digits and below zero once the sun retires for the night. In the picture above that I took yesterday you can see the preparations for Martini Friday set out in the snow next to one of our blueberry bushes. What you can’t see in this tableau is that it takes place on a pile of snow next to our driveway that is nearly four foot deep. The snow pile covering our strawberries is closer to five feet high and the plow pile on the end of the drive is taller still. The Weather Channel is calling for additional snow next weekend. Enough already! In fairness, it has been one of the coldest winters in the past half century in much of the East. New England in general and Maine in particular is accustomed to snowy winters. Heck, it’s not unusual to have snow fall into late April and even May. But most years there is a sort of an ebb and flow, snowfall followed by warmer temperatures that help melt and clear away some of the white stuff to make way for later storms. Usually by mid March, we can see the beginnings of “Mud Season” with puddles large and small beginning to form as warmer temperatures begin to wrest away control from the arctic influence. While I am not normally a big fan of Mud Season, it is a necessary transition to the reemergence of grass, flowers, leaves and all things that mark the beginning of spring. The thing about living in a state with four (five if you count Mud Season) seasons like Maine is that as you near the end of one season you begin to long for the next. As much as I enjoy watching the snow fall, skiing on the fresh powder, watching hockey and sitting by a warm fire, by March I am craving the gradual return of warmth, the tulips and daffodils peeking their heads though the dirt, and the trees sprouting leaves that will provide shade, shelter and color to the landscape. I look forward to going out to get the newspaper or the mail from the box without having to bundle up in a coat, hat, and gloves. I’m anxiously waiting on Spring …as I will summer in another three months. This entry was tagged arctic influence, cold, four seasons, ice, mud season, snow, snow fall, waiting on spring. Bookmark the permalink.